Earlier this year, when in Durban at Indaba and introducing the concept of the Republic of Swellendam to interested parties, we were again reminded how much we love spicy South African food. And when it comes to spice, Durban brings it. One of the many unusual dishes to found here at the bottom of Africa is this novel way of having some fresh bread and a strong curry. 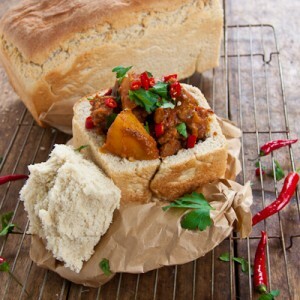 Bunny chows, a proudly South African meal, is a 1/4 or 1/2 loaf bread, hollowed out with curry in the center. Bunny chows are probably one of my all-time favourite ways to eat curry. The origins of Bunny Chow are not quite clear but it is believed that the workers from the sugar cane fields in Durban, South Africa, needed a way to carry their lunches with them and the hollowed out bread filled with warm, spicy curry was the perfect way to do that. 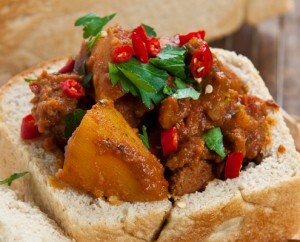 You can be rest assured however, that there is NO bunny meat in a Bunny chow. There are many other stories about the origins of bunny chow but this is the one that I like the most. I like my Bunny’s quite hot and spicy. But just adjust the chillies and garam masala to your taste. There really is not much more to be said about this dish, honestly, you just have to try it if you haven’t. And of course, you don’t have to worry about baking your own bread. As long as you get the freshest bread you can, they will be perfect. 1. In a large pot, fry the onions, garlic, chilli and ginger until soft and fragrant. Add the lamb and brown in the pan for 3-5 minutes. 2. Add all the spices and stir to coat the lamb. Allow to fry for 1-2 minutes. 3. Add the chopped tomatoes and sugar, stir once again to coat the lamb and then add enough water to just cover the lamb. 4. Allow the lamb to cook for 30 minutes covered and then add the potatoes. Add more water if necessary and allow to cook for 15-20 minutes until the potatoes are cooked and the lamb is soft. 5. Slice the bread into 1/4′s and hollow out each piece, making sure not to scoop all the way through, you need a bit of bread at the bottom so the curry doesn’t just run out. 6. Spoon the curry into the hollow and place the chunk of bread on top.